With the Redington Women’s Sonic-Pro Waders, anglers get superior fit and performance at a reasonable price. 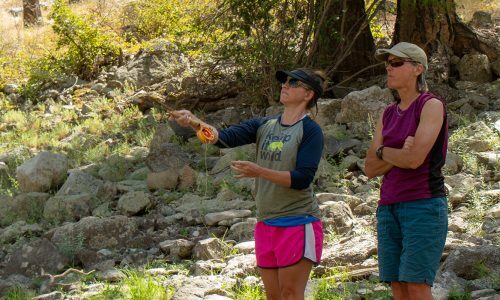 Although it costs $100 less than the Patagonia Women’s Spring River Waders (which scored the highest for fit), the Sonic-Pro is nearly as flattering, and it’s comparable in terms of features and durability. It’s an all-around performer that will satisfy diehards and occasional anglers alike. 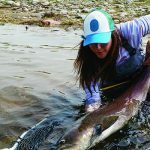 Over the past five years, Redington has been steadily improving its women’s waders, but the Sonic-Pro is its best offering yet: This model marries outstanding fit with a construction that’s ideal for diehard anglers. Testers raved about the flattering, low-bulk cut. Instead of swaddling the angler in yards of baggy fabric (as yesteryear’s waders tended to do), the Sonic-Pro features a more tapered cut through the legs and hips. The result is a fit that feels more like a pair of jeans than a garbage bag—which impressed us. Three leg seams (one up the back plus one on each side of the leg) create a more tailored shape, and two darts at the knees reduce sagging fabric. The construction reminded us of top-shelf ski apparel: Imagine the superior fit of Arc’teryx jacket or pants, translated to fishing. Despite the trim cut, we enjoyed full freedom of movement to step up tall, undercut riverbanks or swing a leg over a boat’s gunwale. The articulated seams ensure that the body-skimming construction doesn’t result in a constrictive feel. The fit allows enough extra room for base layers and even work pants worn underneath, but quilted leggings and expedition-weight fleece maxed out the available space. Steelheaders and other anglers who regularly fish in cold weather might consider sizing up to get ample room for extra-bulky insulation or multiple base layers. Even the bib reduces excess fabric and bulk, while still accommodating anglers’ breasts. Stretchy side panels and elastic cinch cord around the top let testers expand the opening (C and D-cups achieved a comfortable, flattering fit) or cinch it down to eliminate gapping. Even the booties eliminate the excess fabric that used to be the hallmark of all waders, but especially women’s models. One small-footed tester (who wears a women’s 6.5 street shoe) enjoyed a trim, foot-hugging fit that nested comfortably inside a range of wading boots. The trimmer fit eliminates the folds of fabric that can crate chafing while wading. Yet the booties still allow enough room for extra insulation, like thick wool or neoprene wading socks. Because it’s offered in multiple lengths and even a full cut, the Sonic-Pro also fits a broad spectrum of body types. All waders balance breathability and durability: As you increase the number of fabric layers to guard against punctures and leaks, you inhibit the ability for sweat to escape. The Sonic-Pro uses a four-layer construction, but breathes more like a three-layer fabric. Even after sustained climbs out of river valleys on hot, 85°F fall afternoons, we didn’t feel soaked from the inside. Testers also loved the stretchy mesh backpanel, which connects the shoulder straps to the bib. It kept our backs feeling tolerably cool on sweltering, sunny days. 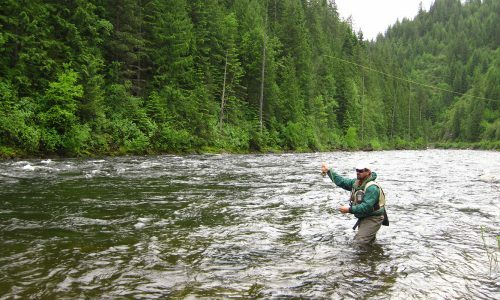 Testers who typically fish with a sling or backpack particularly liked this feature, since it alleviated some of the sweat buildup anglers typically experience when wearing packs. We tested the Sonic-Pro from August through May, and didn’t experience any scuffs or leaks—nor would we expect to. Waders should be capable of remaining leak-free for much longer. Yet at the end of that 10-month period, the nylon twill face fabric still looked brand new. 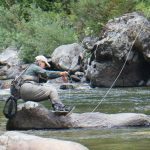 The four-layer construction is among the toughest on the market (the Orvis Women’s Ultralight Convertible Waders, the Patagonia Women’s Spring River Waders, and the Simms Women’s G3 Guide Waders also use four-layer fabric). The Sonic-Pro’s welded seams also promise to stave off leaks over the long haul: Whereas stitched seams create long rows of puncture holes that need to be seam-sealed in order to keep water out, welded seams eliminate holes and reduce the likelihood of eventual leaks. Burly fabric and strong, long-lasting seams make the Sonic-Pro ideal for anglers who fish regularly, rather than occasionally. This is a guide-worthy build, capable of standing up to daily wear. The soft nylon twill used for the Sonic-Pro’s face fabric makes these waders more comfortable than most. It has none of the plasticky feel that’s typical of some waders—instead, it feels more like a pair of cotton duck work pants. It’s also quieter: When testers walked, they didn’t hear a loud “swooshing” sound made when the leg fabric rubs together. The chest pouch is lined with a very thin microfleece that offered a smidge of warmth on late fall days. It’s not plush enough to truly revive hands that have spent significant time in near-frozen water (anglers who routinely fish tailwaters in winter will still need mitts or gloves). 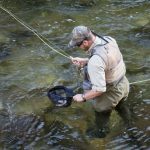 But it’s a feature that most of this test’s waders lacked: Only the Patagonia Women’s Spring River Waders build a handwarmer feature into the chest pocket. 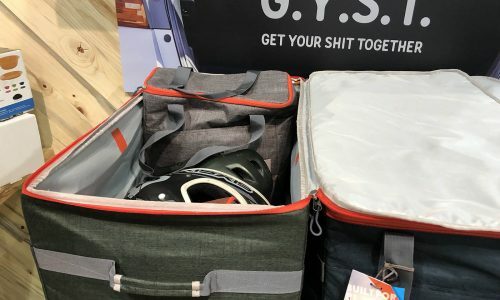 The bib actually includes three pocket options: In addition to the pass-through handwarmer, there’s a zippered outer pocket and an open-topped mesh inner pouch with a key clip and a detachable waterproof phone bag. That’s a lot of storage, and testers appreciated the ability to secure car keys and a cameraphone. 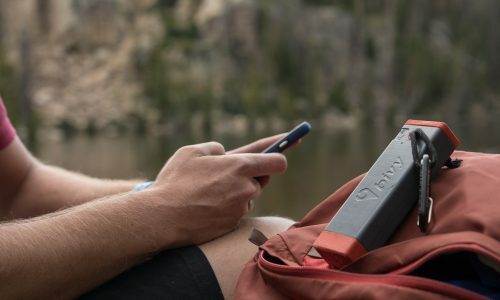 Because it’s big enough to hold a fly box, the inner mesh pocket facilitated fast-and-light fishing sessions when testers found they could leave their bigger packs and slings behind. But all those pockets also add bulk to the chest zone and stiffen the fabric overall: The chest of this bib feels almost armored. 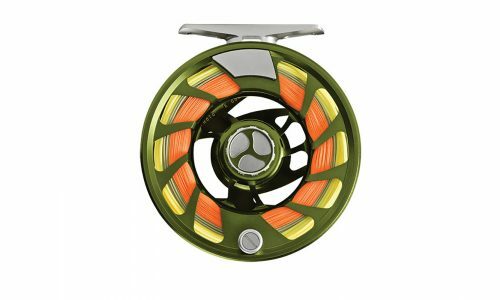 Small-chested testers didn’t mind the additional layers, but large-busted anglers preferred the trimmer, more supple fit provided by the Orvis. Anglers of all sizes found that even with several layers of pockets, they could still roll down the bib for pants-only coverage in hot weather or low water. Testers’ biggest nitpick was with the gravel guards, which fit so snugly over wading boots that anglers had to wrestle them over their laces. The upside? These gravel guards invariably stayed in place while wading. 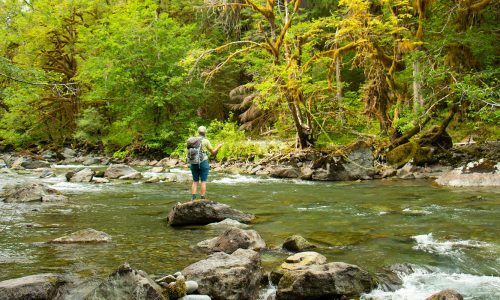 Some ultra-rugged fishing waders feel too stifling for hot-weather wear, but the Sonic-Pro hits the ideal balance between protection and breathability. We found it to be tolerable in Colorado’s 90°F afternoons, yet warm enough for shoulder-season fishing sessions (the bootie is made of 4mm neoprene, which provides better-than-average insulation). The Sonic-Pro is warm where it needs to be, and cool where anglers appreciate more ventilation. The fit and fabric makes the Redington Women’s Sonic-Pro feel more like comfy jeans than waterproof waders. 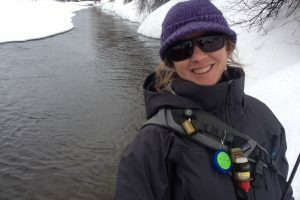 Mountain-dweller Kelly Bastone became a writer so she could stop asking the boss for permission to take a powder morning, enjoy extra-long lunch breaks to fish or mountain bike, and clock out early when the hatch is on.